The majority of our class timetable takes place in our bright & airy fitness studio . All classes are FREE with membership . Full Peak membership covers all classes , while Off-Peak membership covers classes during off-peak hours only. All classes are tailored to the participants abilities .The timetable is updated every 4-6months , if demand for more classes before this time. Classes are booked on a week to week basis, we do not do courses . A minimum of 3 people for full classes to go ahead, if 2 people attend classes will be shorter than advertised. Some classes have a maximum of 10 spaces. Please book at reception or on Facebook page to ensure your space. * Kids group swimming lessons are held on Saturdays from 9am. Instant Real time fitness tracking is coming to our class schedule . MYZONE is a chest strap monitoring system that tracks your heart rate, calories burned and effort accurately in real time. The technology gives you the insight you need to tailor your physical activity in order to achieve your fitness goals. MYZONE measures the effort exerted by your heart, which is the most accurate way to measure the intensity of your physical activity. The information will be sent to a live feed on a 43″ TV screen in the studio so you can see how hard you are working . 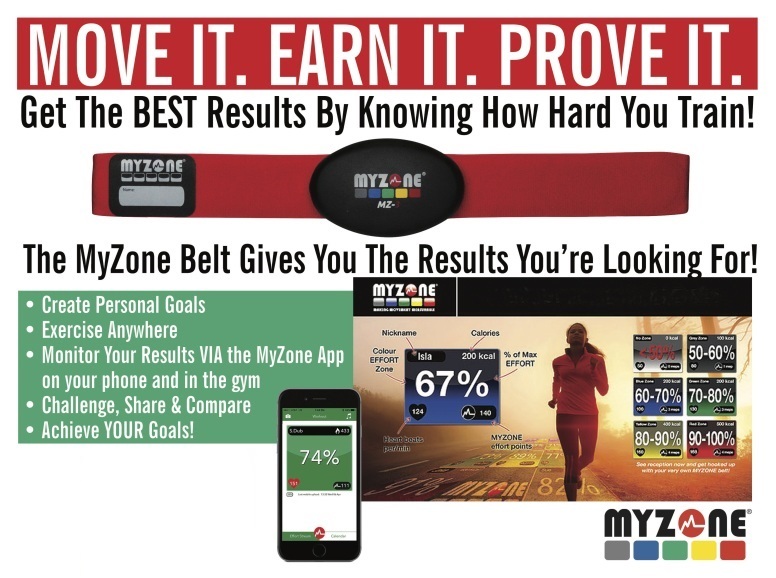 The Myzone belt can also be used for your own training outside of the gym , an app can be downloaded to your phone so you always have the information right at your fingertips . If you are interested in a belt please talk to staff . Mainly floor work . Engaging the core , increasing flexibility & core strength . Excellent compliment to your other training & day to day life. A fun and enjoyable workout to music while in the water. This class is suited for all levels of fitness and aims to give you a total body workout combining cardio fitness, muscle conditioning and strength. No swimming skills are required to participate in this class. It caters for all levels of fitness. Our Group adult swimming classes are very informal. The teachers will gear the class towards the needs of the group and will concentrate on any aspect of swimming you wish to improve on. Varied class that aims to work on cardio, endurance and core, using a variety of equipment . Works on flexibility , range of movement . Circuits class specifically designed for beginners to make you stronger , fitter & more confident . A slight slower pace than the normal circuits but still guaranteed a great workout ! Aerobics is making a comeback at CLC . Combing great music and some easy moves . You wont notice the calories melting away . Finishing the class with a bootcamp or pilates hit.